The general election two years ago set Texas Republicans on a red-meat sprint in the 2017 legislative session. This year, the tone is quieter, and the agenda is laden with bread-and-butter issues. 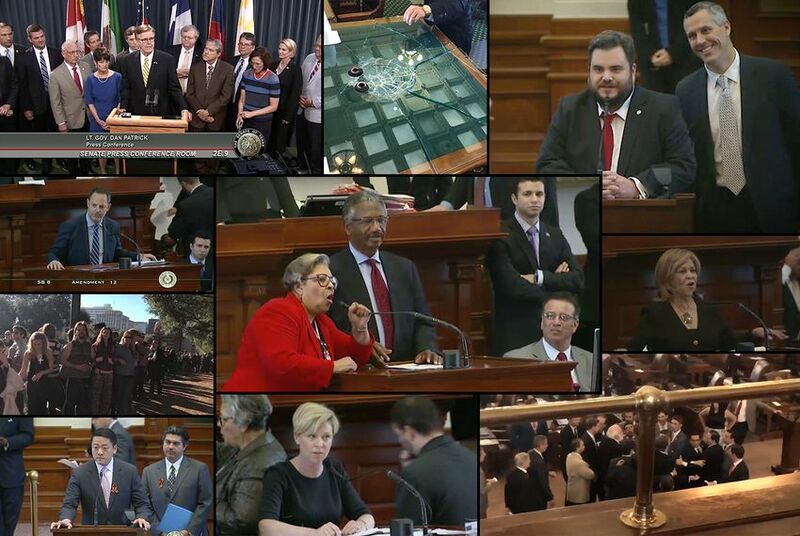 This time two years ago, America had just elected Donald Trump and Republicans in Texas were preparing for the 85th legislative session with visions of a conservative mandate dancing in their heads. The 2016 campaigns were loaded with the sort of voter feedback that politicians read as operating instructions, and the result was a red-meat session for the GOP, complete with a tight budget, a stringent sanctuary cities law that included a “show-us-your-papers” provision that many lawmakers say was unneeded, punitive and even racist. There was a fight among the Republicans about a “bathroom bill,” followed by another about how much the state should restrict local governments’ ability to set local property tax rates. The pre-game routine for this session is quite a bit different. Those statewide Republicans got re-elected, but by smaller margins — sometimes, much smaller — than Texans in that party generally expect. That wasn’t the worst of it: The Texas GOP lost two seats in the congressional delegation, a net of one seat in the state Senate (though two Republican senators lost re-election on Election Day), a dozen seats in the Texas House and various down-ballot contests for state appellate courts, county judgeships and other local offices. The talk preceding the 86th legislative session is all about bread-and-butter issues: a state budget strained by the costs of fast growth, a record-setting hurricane and rising medical costs; voter and property-owner demands for property tax relief; and high state officials, starting with the governor, pushing for school finance reforms that could cost taxpayers billions of dollars, offset largely by those promised property tax cuts. Two years ago, Republican politicians were feeling unshackled after eight years with a Democrat in the White House. Now they’re defending one of their own in the White House who makes a good number of them uncomfortable. The Texas presidential talk used to be about figures like George W. Bush, Rick Perry and Ted Cruz. For the moment, it’s all about Democrats. O’Rourke is famous for giving Cruz a closer challenge than any top-of-ticket Democrat has given a Republican in this state since the 1990s. He lost, but he lost little instead of losing big. He lost in a way that showed possibility, and Democrats in Texas and beyond were speculating about him as a national candidate before that race was even over. And despite early indications that he was only interested in Cruz’s seat, he now says when asked about future runs for office that he’s not ruling anything out. Julián Castro, the Obama administration secretary of Housing and Urban Development and a former mayor of San Antonio, has held meetings with presidential fundraisers. It was a smaller ripple because he’s been looking at the race longer — and he wasn’t the Democratic star of the 2018 general election in Texas. But he’s in the mix. That mix is similar in some ways to what the GOP concocted on the way to Donald Trump’s 2016 nomination and victory: There’s not a real giant among the crowd of candidates. There are famous names and faces, like John Kerry and Joe Biden, who’ve run before. But there are lots of new names among the applicants vying for support from Democratic voters who either haven’t thought about who should run in 2020, or haven’t decided on a favorite. The field will shrink, as it always does. It shouldn’t be a surprise that Texas is a farm team for national politics, either, though it’s unusual that the new prospects would be under the Democratic flag instead of the Republican one. Republicans still rule the state government. The coming legislative session isn’t likely to end up in anyone’s liberal trophy case. The pre-session tone is about bread-and-butter stuff because that’s what Republicans are talking about — not because they’ve suddenly fallen in league with the Democrats. They’re more measured because the voters were more measured, keeping Republicans in power, but turning down the volume. Analysis: Is ending a tax break easier to swallow than a tax hike?